No matter how successful children will be in the other aspects of their lives, if their financial affairs will be in a mess, they will live stressful lives and can never be truly happy. The sons of the author as graduates. 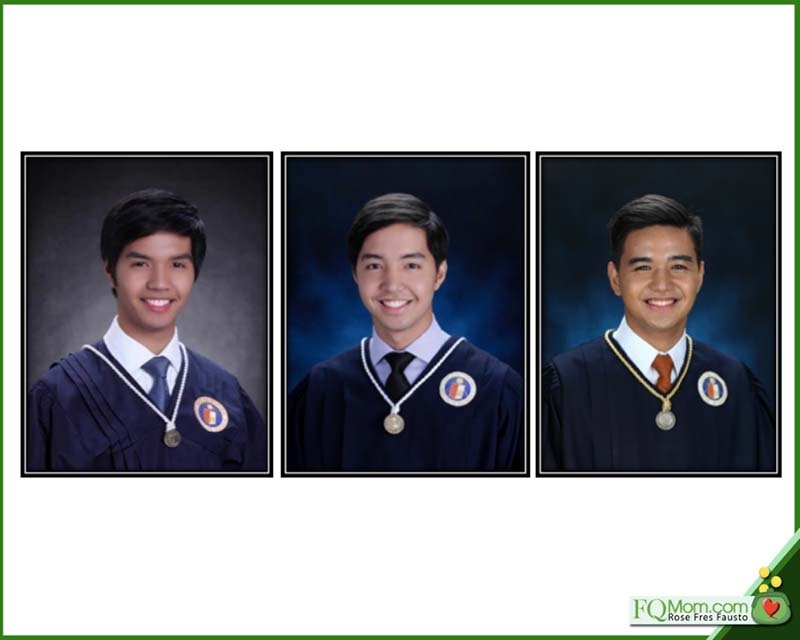 From L-R: Martin BS Management, 2012; Enrique BS Management Engineering, 2015; Anton - BS Communications Technology Management, 2018. But reaching this point is not so easy in the Philippines. In a country where families already put high value on education, only 23% of Filipinos finish college (click survey). Henry Motte Munoz, a French- Filipino who graduated from the London School of Economics and Political Science and took up his masters at the Harvard Business School, was on one of his holiday visits to his mother’s hometown.He found himself talking to a cousin about the latter’s plans for college, “How do you go about applying for college here? How do you choose which school to go to? What do you do if you don’t have the money?” His cousin’s answers made him realize that there was much to be done to help Filipino high school students pursue their college dreams. Moreover, the story of the UP student who ended her life when their family could not afford to pay the P10,000 tuition fee hit him hard. The result: In 2015, Henry said goodbye to his investment banking career in London, packed his bags and came back to the Philippines to set up Edukasyon.ph. Edukasyon.ph is a social enterprise that connects students to education opportunities through online platform and promotes career awareness among Filipino youth. Today, over four hundred partner-schools have signed up with this portal that is visited by over a million students per month. In fact, you can find over 13,000 schools, 20,000 courses, 50,000 scholarships in the website. It has now become a one-stop comprehensive platform and source of information on opportunities here and abroad for both students and parents. They can now search, inquire, and apply for courses, see available scholarships, and manage tuition fees through its online payment system. Left: Henry Motte Munoz photo from Lifestyle Asia Magazine, October 2017 issue, Right: Edukasyon.ph portal. 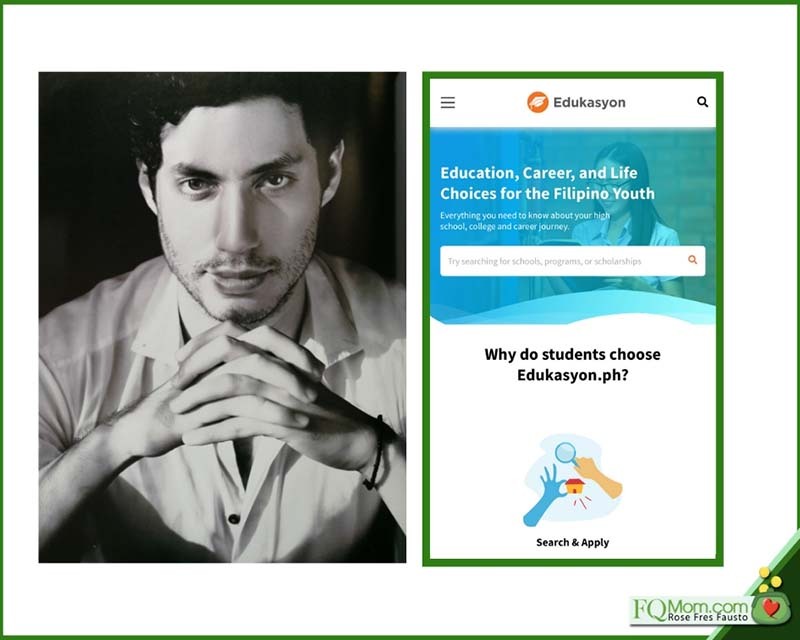 Edukasyon.ph does not only help students find their schools here and abroad, but offers more to empower the students to make the right life choices. They have a vibrant blog that offers useful articles on adulting, girl power, career conversations, parents’ concerns and many more. Last year, I was approached by Judge Calimbahin III. Okay, don’t be fooled by the name, I’m not talking about an old member of the court of justice here, but the young chief of staff of Edukasyon.ph to help them come up with the FQ content for their portal. Later on, I would meet the other members of the team – Olivier Motte, the French father of Henry, Patricia Matias, Apple Nocom, and Henry himself. The company is now 70-employees strong. 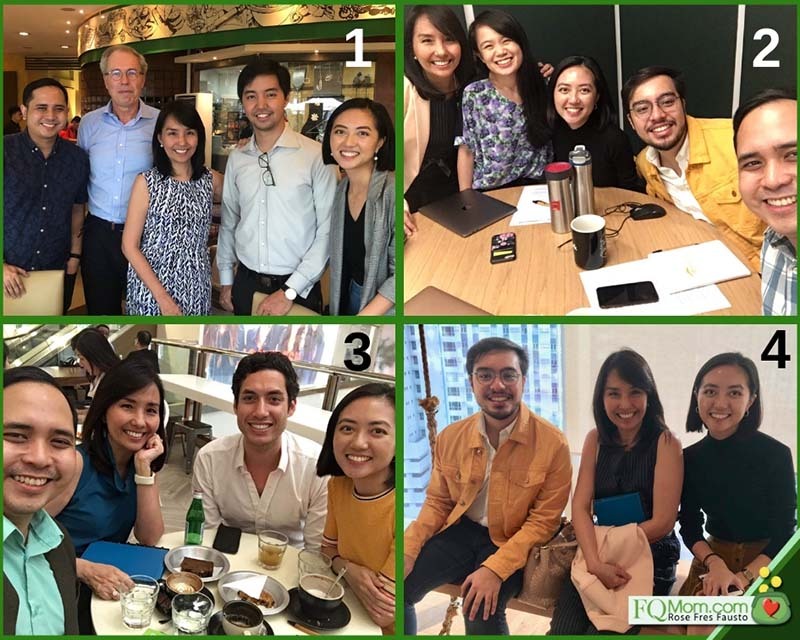 The author shown in meetings with Edukasyon.ph team members Olivier Motte (Photo 1: 2nd from left); Patricia Matias (in all 4 photos: 5th, 3rd, 4th, 3rd from left, respectively); Judge Calimbahin III (Photos 2 and 4: 4th and 1st from left, respectively); Apple Nocom (Photo 2: 2nd from left); Henry Motte Munoz. Also shown in photos are the author's son Enrique Fausto who joined one meeting (Photo 1: 4th from left); FQ Mom Associate Gem Mailum (Photos 1, 2, 3: 1st, last, 1st from left, respectively). Soon after my initial meeting with judge, I knew that I would really want to work with this group. When I met the founder Henry, his remark, “Rose, I’d like you to set up and be the ‘Dean of the FQ College’ of the Edukasyon.ph University!” sealed the deal! 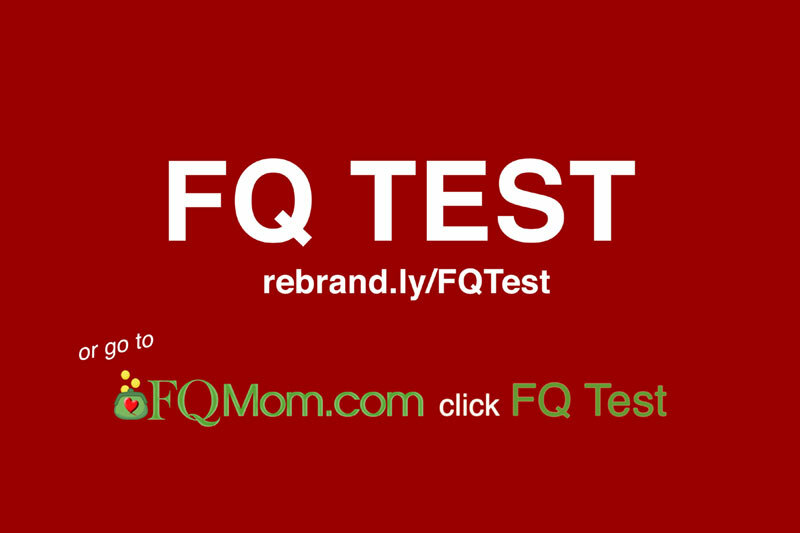 How can I refuse the opportunity to teach millions of young Filipinos about the importance of FQ at this crucial stage – i.e. before they receive their first sueldo? After a couple of interesting and insightful meetings, we finally signed our engagement on March 1, 2019. I’m very excited about this partnership because my lofty dream is to raise all Filipino children to have high FQ! I have raised three, and based on the feedback I continue to receive from my readers and talk attendees, I have helped them do the same for their own children. FQ Mom and Edukasyon.ph contract signing on March 1, 2019. We have started publishing FQ articles in Edukasyon.ph portal in March. (Click link). We are also in the process of preparing an online FQ course that will help each student come to terms with his/her relationship with money, understand the laws of money, and design his/her life to make sound financial decisions and actionsan integral part of everyday living. It’s both exciting and challenging. This FQ Tita has to speak in Gen Z language to keep their attention and engagement. Should you have suggestions and even challenges with your Gen Z family and friends regarding money, please send them to me. These will definitely help us in our course preparation. FQ is such an important life skill that I dream of being taught to each child together with ABCs and 123s. Because no matter how successful our children will be in the other aspects of their lives, if their financial affairs will be in a mess, they will live stressful lives and can never be truly happy. To find out more about the multi-awarded man behind Edukasyon.ph, watch our FQwentuhan with Henry Motte Munoz on Friday at 8 a.m. Our Mom and Son Podcast this week (click links in Announcement to listen) is also helpful material for students and parents as our guest, Teacher Michelle Kawpeng, a successful dance coach, provides interesting tips and insights on how to pursue a non-traditional career path using your gift, and thrive! Cheers to raising all our children with high FQ! 1. Dancing as a career? 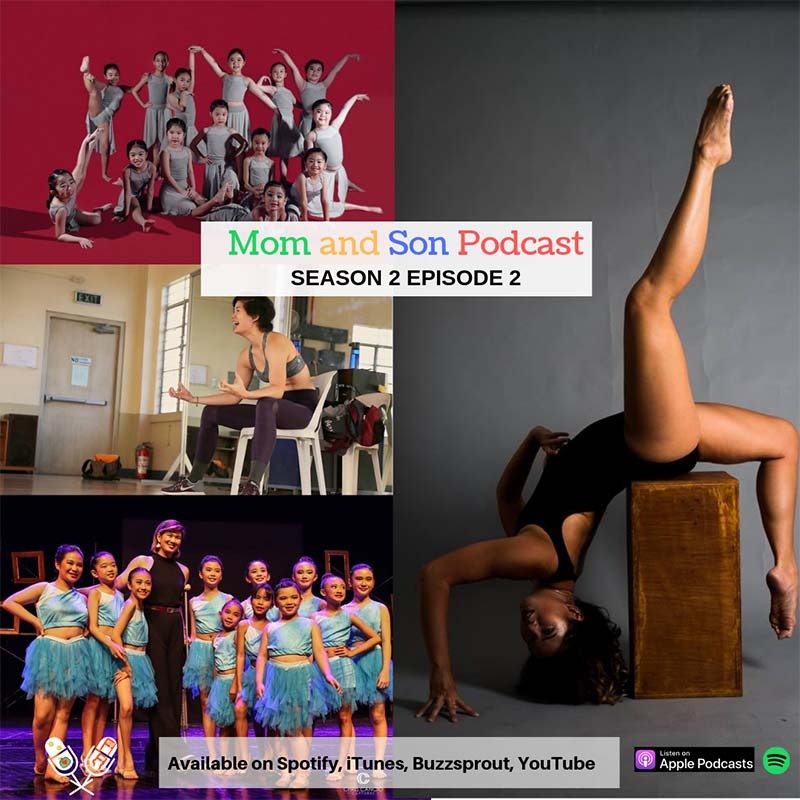 In our latest Mom and Son Podcast episode, we learn the story of Mitchi Kawpeng, director of RedPH. What are the challenges she faced to build her career as a dancer and a coach? How does she do it? We discuss the importance of always being open to opportunities and taking that scary step to achieve your dream. 2. 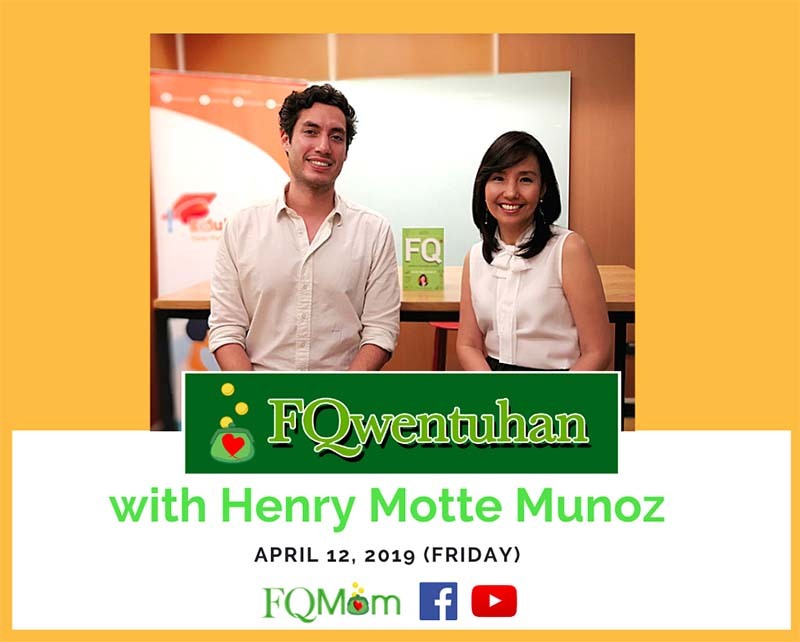 This Friday, April 12, our FQwentuhan will feature Henry Motte Munoz, founder of Edukasyon.ph. We will be discussing how he founded Edukasyon.ph, his 30 under 30 recognition, his childhood money memory and FQripot tips! Watch this episode to learn more about him and his platform, Edukasyon.ph! You may now purchase the book in major bookstores, or if you want autographed copies, please go to FQ Mom FB page (click SHOP), or FQMom.com (click BOOKS), or email us at FQMomm@gmail.com. ATTRIBUTIONS: Photos from Edukasyon.ph, Lifestyle Asia October 2017 issue, and huffpost.commodified and used to help deliver the message of the article. Survey mentioned in this article can be found in this link.